Myelofibrosis is a condition where scarring (fibrosis) forms in the bone marrow. This scarring makes it difficult for your bone marrow to make blood cells normally. Enlarged spleen and/or liver - you might notice a fullness below your ribs. Myelofibrosis generally occurs in people over the age of 50. It can occur in children but is extremely rare. Patients with polycythemia vera or essential thrombocythemia may go on to develop myelofibrosis. Why Does Your Spleen Enlarge? The spleen is a hematopoietic organ, meaning that it has the potential to make blood cells. In myelofibrosis, where the bone marrow is having difficulty making blood cells, the spleen enlarges to try to improve production. Primary myelofibrosis is a rare form of blood cancer (part of the chronic myeloproliferative neoplasms). This is caused by a genetic mutation. At this time we are not sure what causes the mutation to occur. Pulmonary hypertension: In this condition, there is elevated blood pressure in the blood vessels in lungs. Renal ostoeodystrophy: This is a disorder of mineral and bone metabolism that occurs in patients with chronic kidney disease. 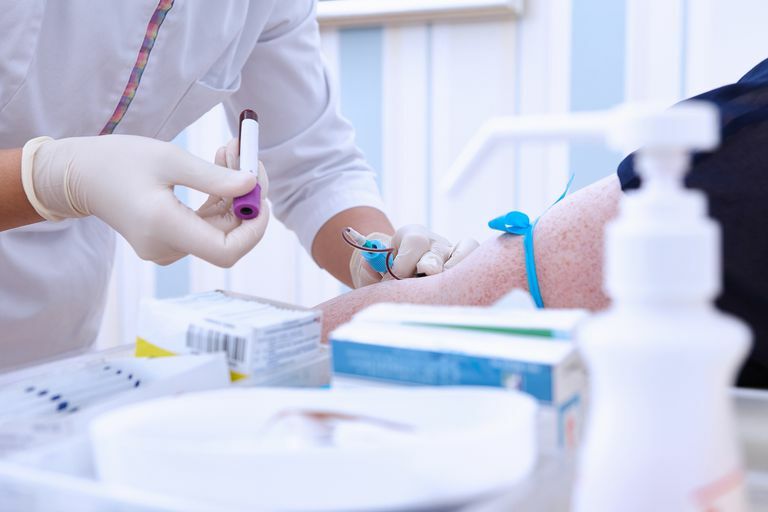 Initially, the decreased blood counts are identified on a complete blood count. Generally, anemia and/or thrombocytopenia are present. The damage to the blood cells can often be identified on a peripheral blood smear, a microscope slide of a drop of blood. The red blood cells are often described as looking like a teardrop. Final diagnosis requires a bone marrow biopsy, a procedure where a small piece of bone marrow is removed. With special staining, the fibrous strands in the bone marrow can be identified. During the diagnostic work-up, your physician will try to determine what causes the myelofibrosis. Included in this work up will be genetic testing for specific mutations called JAK2, MPL, and CALR. Treatment is dependent on the primary cause. Treatment of primary myelofibrosis is determined by the risk of disease progression and overall survival. Observation: If you aren't having significant symptoms, watchful waiting may be the best choice of treatment. Transfusions: The anemia and thrombocytopenia seen in myelofibrosis can be severe and may require frequent blood transfusions. Frequency of transfusions may determine if more intense treatment is needed. Bone marrow (stem cell) transplantation: The decision to transplant must be weighed carefully looking at both the risks and benefits. Ruxolitinib: This medication inhibits JAK2 can be used in patients with JAK2 mutations who have significant symptoms and are not eligible for bone marrow transplantation. Splenectomy: If the spleen does not decrease in size from treatment, it may be removed surgically. Hydroxyurea: Hydroxyurea is an oral chemotherapy medication that can be used to reduce spleen size and other symptoms. Treatment for secondary myelofibrosis is directed at the underlying cause. So if myelofibrosis is caused by a cancer such as acute myeloid leukemia (AML), it is treated with chemotherapy. If myelofibrosis is secondary to an autoimmune disorder, treatment of that disorder may improve blood counts. Whatever the treatment, your medical team will walk you through all the steps you need to take to be in control of your health. Don't hesitate to share your thoughts, questions, and feelings with them.